Former PM attacks Netanyahu: I blame Netanyahu for leaking Gantz's phone story. He also leaked during Operation Protective Edge. Former Prime Minister Ehud Olmert harshly criticized Prime Minister Binyamin Netanyahu on Saturday and claimed that Iran would like to see Netanyahu continue in his position after the elections. 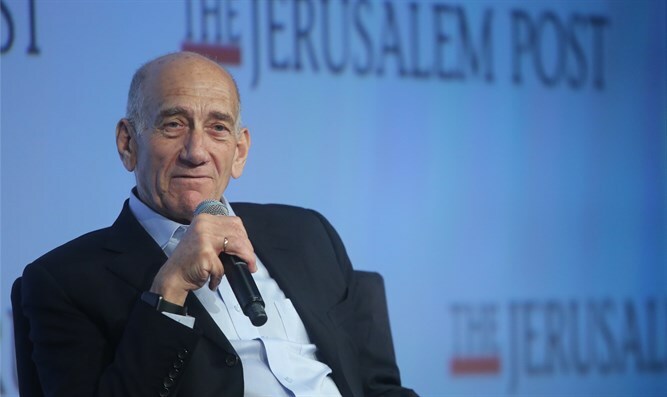 "I recently spoke with leaders in the Arab world, and there is nothing that Iran wants more than Bibi as prime minister," Olmert said at an event in the Arab city of Baqa al-Gharbiyye, according to a report in Kan News. "They know the gap between his talk and his actions. I blame Netanyahu for leaking the story about the hacking of [Benny] Gantz's phone. He also leaked things during Operation Protective Edge, that's part of his practice. Bibi was and remains a failed prime minister. Gantz is more suitable,” claimed the former Prime Minister. "I will not vote for any party that will support the existing government. The time has come to put this on the table - the one who proposed returning the Golan [to Syria] is Netanyahu, he is the first Prime Minister to have an Iranian presence on the border with Israel during his tenure,” charged Olmert. "There is a gap between his big words and threats and reality. I never announced that I would destroy the Hamas regime, Netanyahu did,” he added.